For a day in May 2014, love was in the air across all the polytechnics in Singapore – literally. 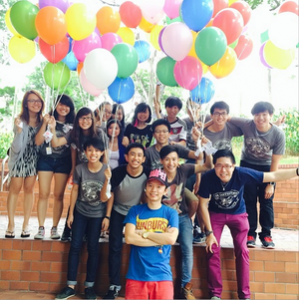 Inspired by the other #LoveOthers14 initiatives, the polytechnic students in Heart of God Church decided to come together and give out 1,000 helium balloons to their schoolmates. Seeing how exciting the initiative was, even the balloon supplier joined in to help. On top of the balloons, the youths also handed out 4,500 encouraging notes and 19,500 lollipops. The initiative was a smashing success across all five schools. Many of their friends loved the colourful surprise and raved about it on their Instagram feeds! In total, more than 20,000 people received surprises from this incredible group of people that day!